The charter of United Nations established six principle organs of United Nations. The six Principle organs are listed below and written about them in brief. The United Nation General Assembly UNGA is called as town meeting of the world or Parliament of the world. The general assembly meeting happens at least once in a year and session commences on third Tuesday of September. The Assembly can also meet up for special emergency sessions. The presidency of the assembly rotates each year among the five geographical groups of the countries viz. African, Asian, East European, Latin American and Western European and other states. General assembly appoints the secretary general of UN secretariat on the recommendation of the security council, It is also empowered to admit new members. The United Nations Security Council UNSC bears the primary responsibility for the maintenance of international peace and security. UNSC is designed to be the UN’s only action agency and is often described as the enforcement wing of the UN. The UNSC comprises of five permanent members namely China, France, Russia, UK and USA and 10 other non-permanent members, elected for a term of 2 yaers by a two-third majority of the General assembly. Five non-permanent retire after every year. Retiring members cannot be re-elected immediately. The permanent members in UNSC have the power to VETO any move. If a permanent member abstains, it is not considered as a VETO. 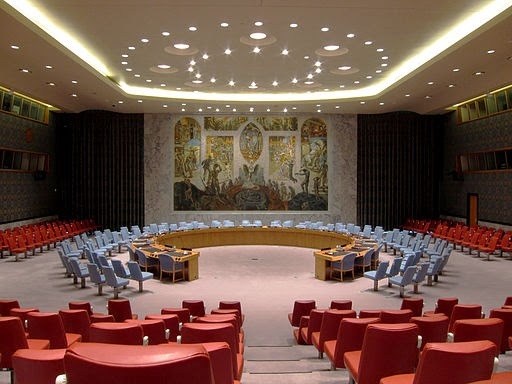 The presidency of the security council is held in turn by the members of the security council in the english alphabetical order of their names. Each president holds office for one calender month. Decision on procedural as well as substantive matters are taken by an affirmative vote of 9 members. On substantive matters involving action by member nations, all permanent members must vote in the affirmative. A single VETO can prevent the proposals from being advanced. UN Economic and social council (ECOSOC) objective is to promote social progress and better standards of life. ECOSOC comprises 54 members, 18 (one-third) of members are elected every year by the general assembly of UN, to serve for three years. The retiring members as well as the president are eligible for immediate re-elections. The functions of EOSOC are performed by nine functional commissions, five regional commissions and a number of standing committees. The UN trusteeship council aims at helping countries under foreign rule to attain independence. There were eleven such counties that had come under this system after the second world war (1939-1945). Most of the countries have attained independence by now. Palau was the last country to get freedom in 1994. The head quarters of UN international court of justice (ICJ) are located in The Hague” (De-0FRacto capital of the Netherlands). ICJ comprises 15 judges, elected by General assembly and security council for a term of 9 years. Each one of them has to from a different country. The ICJ itself elects its president and vice-president for a term of 3 years. All decision’s are made by majority vote of judges present, with nine judges consisting the quorum. The president of the ICJ may cast the second deciding vote in case of a tie. English and french are the official languages of the ICJ. At present, Peter Tomka (Slovakia) is the president of ICJ. The secretariat is an international staff working in duty stations around the world carries out the diverse day to day work of the organization. Secretariat services the other principle organs of the UN and administers the programmes and policies laid down by them. The secretariat is treated as headquarters of UN. Secretary general, who is appointed by the general assembly on the recommendations of security council, is the chief administrative officer of the UN. Secretary general has a tenure of five years and he can be re-elected. Secretary general can appoint his own staff including Deputy secretary general and also he defines his own work. Deputy Secretary General is the second highest rank official of the UN.